The winter season 2011-2012 has been opened! About time, too, given that it has already been a month since my last skiing in the summer. This time I did not get to go to some beautiful mountain, however. Only a small indoor ski hall, a two hour taxi ride outside Beijing. Oh well, at least now I have Asia and China in the bag for this new season. 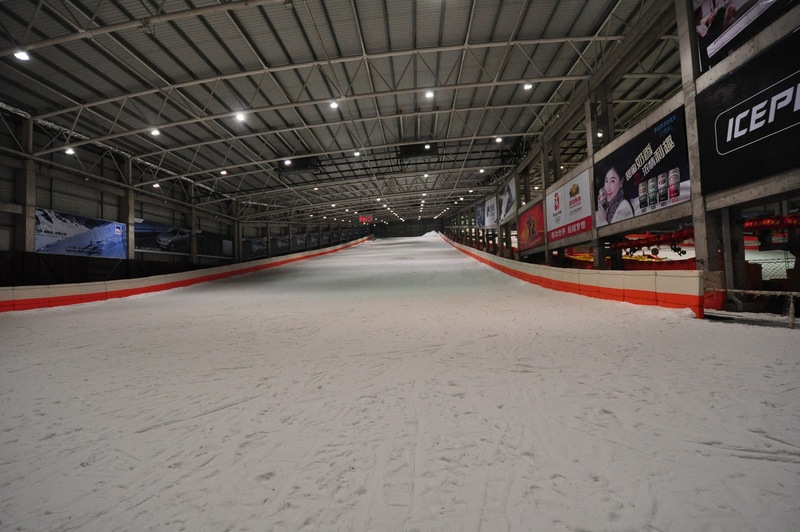 The ski hall is Qiaobo Ice and Snow World, situated in Shunyi, a small town somewhere behind Beijing's international airport. 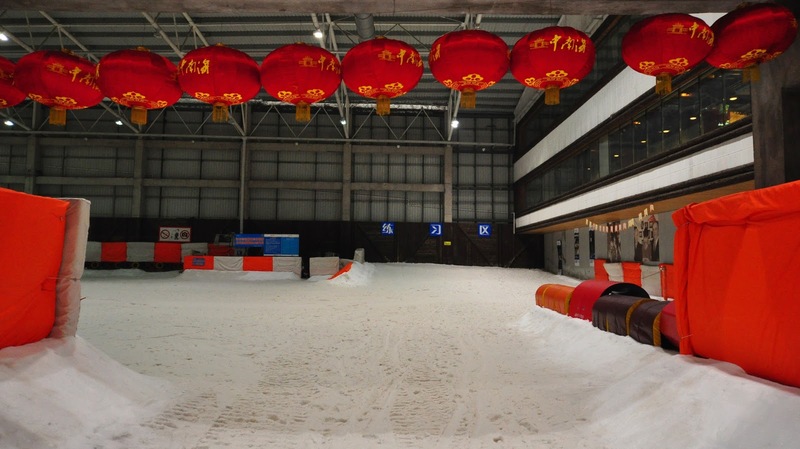 Qiaobo has two ski slopes, a wide and short beginners slope and a little bit longer main slope. 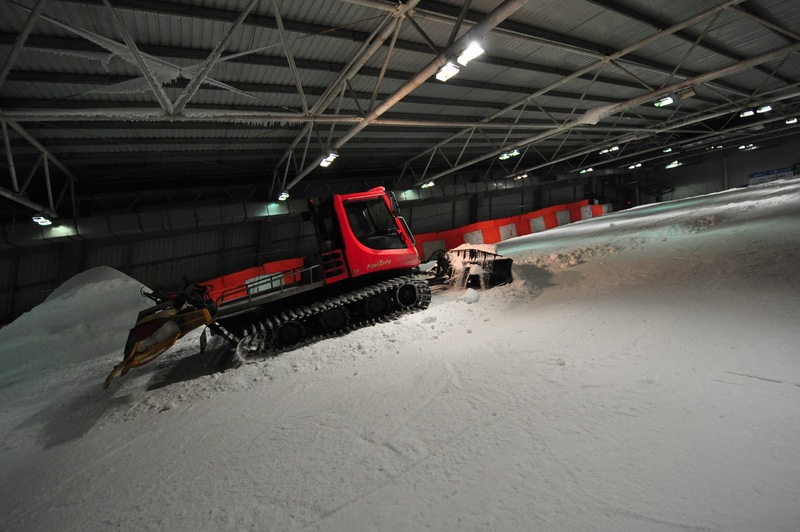 In the main slope there are some jumps and rails for additional fun. I was visiting here in my usual manner: a long day of meetings was over and I headed to the slopes in the evening. Like so often, I was pressed for time. 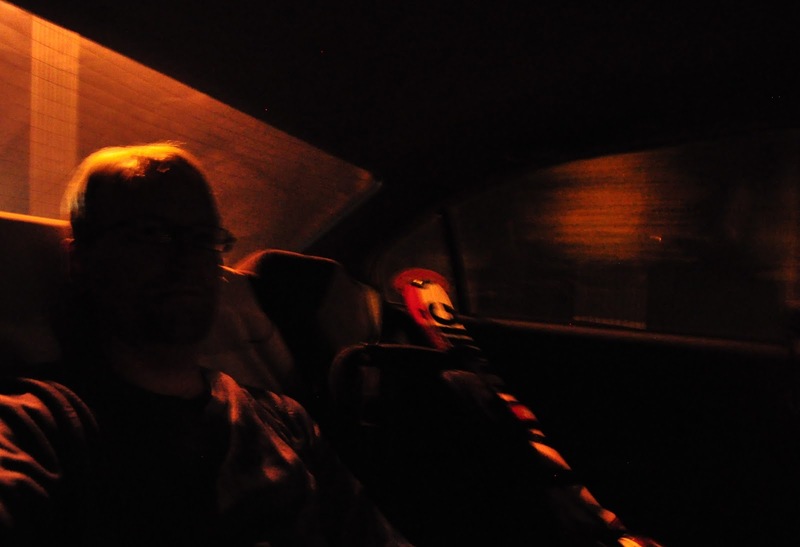 My meeting ended at 6pm, and after a quick change of clothes I managed to find a taxi soon after. But the hotel bell boy thought that it would take three hours to reach the site, and by then the ski hall would already be closed. Luckily the trip only took two hours. 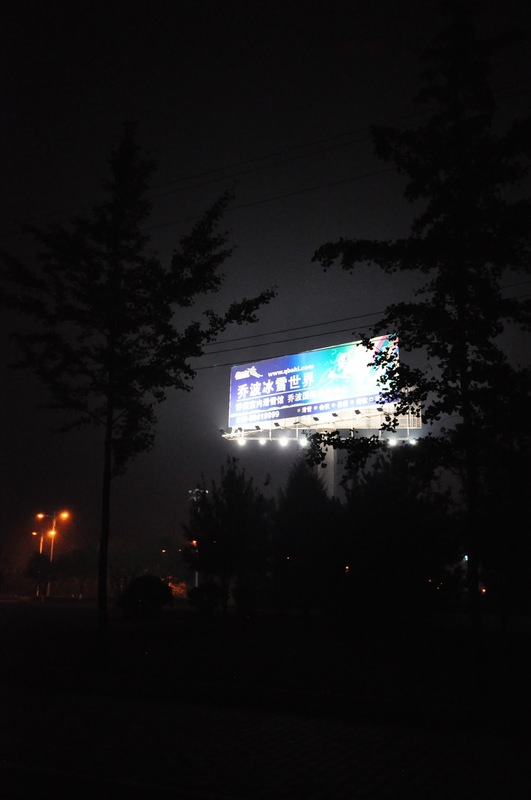 I was also about to lose my faith on the drivers ability to find the place when Qiaobo's sign emerged from the darkness. 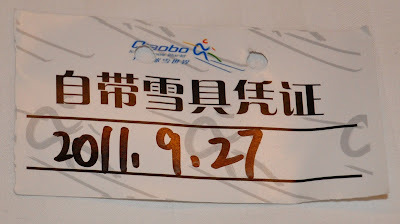 This was my second visit to Qiaobo, so I knew not to expect too much. The slopes are small, the biggest one is 300 meters long at 17 degrees. But the skiing still turns out to be nice, the slope is steep enough and snow forms are varied enough to make it fun. It takes about 20 seconds to ski the slope, but who is counting. A snow cat worked on the upper slope during my visit, so the full length was not in use. But the snow was just right, not hard ice and not too soft snow either. The only downside is that ski lift was very slow, it took about four minutes to go up the small distance. Even if you tried very hard, you could only ski 4-5 kilometers in an hour. 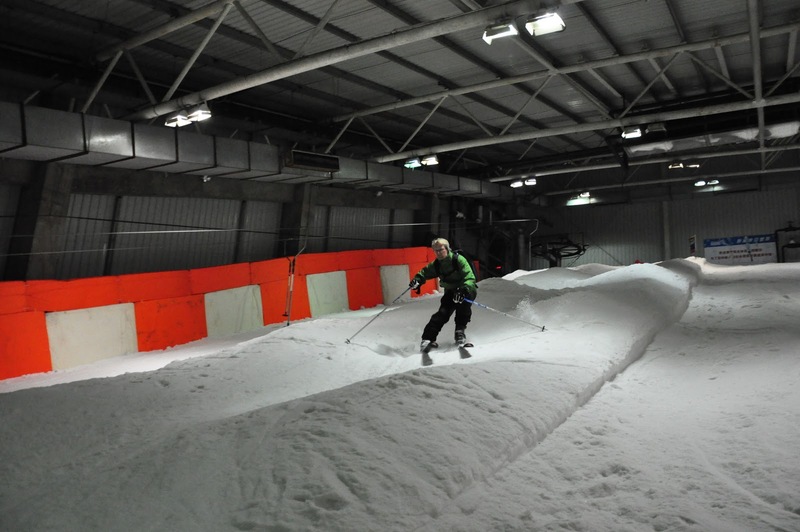 This is actually a common problem for many indoor ski areas. In some there is a fast lift reserved for experienced skiers and ski teams that train there, but the main lift is slow. Presumably this is to make it easier for inexperienced lift users and to keep the actual slope less crowded. But it is annoying. There is obviously other kinds of skiing in China as well. I have only visited another indoor place in Shanghai, the Yinqixing. This is a 380 meter long ski slope, but I found it less interesting than Qiaobo. The slope is divided in two parts, and the lower part is targeted for beginners and is almost level. When I visited this Yinqixing, I had to ask them to start the ski lift on the upper section. The upper section is a little bit steeper, but you will still not be able to make too many turns before you hit the lower section. 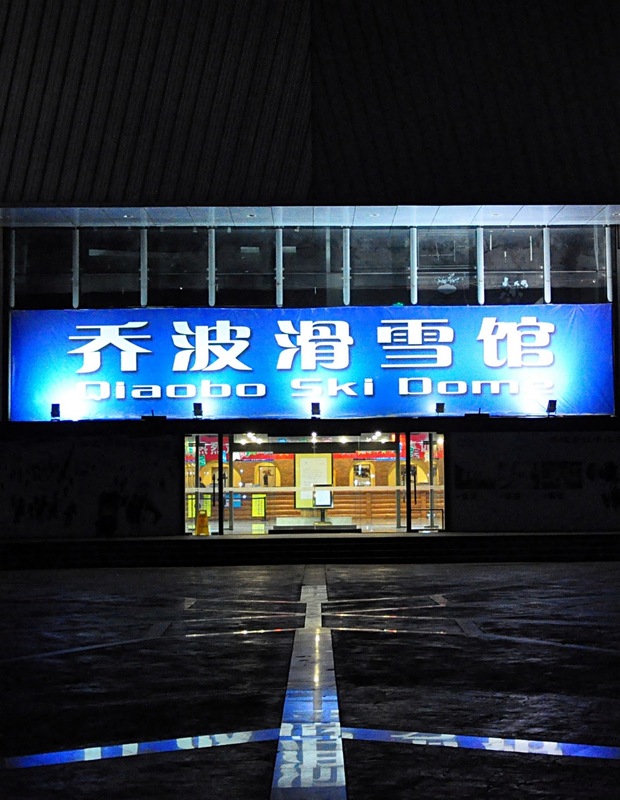 Qiaobo evening lift ticket costs 168 ¥ (about 19 €), but for some reason that was not clear to me, every skier has to pay a 500 ¥ deposit. You will get the difference back when you exit, however. 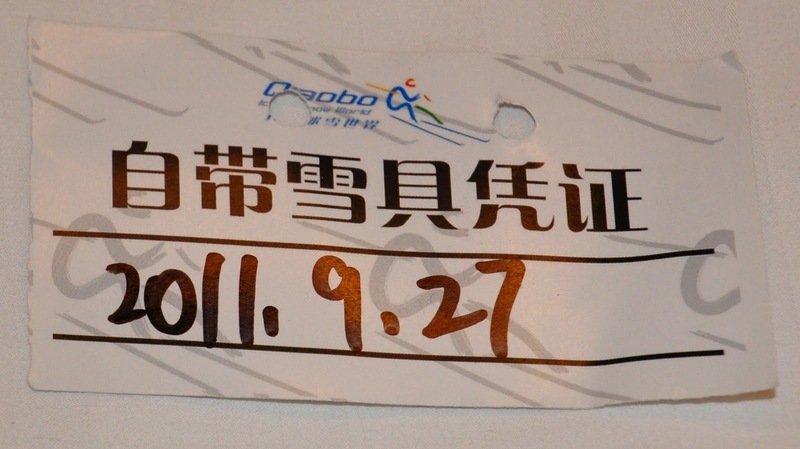 Taxis are very, very cheap in China. My taxi driver drove for three and half hours, and waited for me for an hour outside the ski hall. The total cost for this was 330 ¥ (38 €) plus tip. Qiaobo has services, including food and drink vending machines, a restaurant, and a sports shop. I did not try them out, however, so I cannot report on the price level. But for afterski I certainly recommend heading back to Beijing. A very nice place is The Zone, a small bar on the shores of the Houhai. They also serve food through the night. A big bowl of meat and noodles costs less than 50 ¥ (5 €).